Paleontologists recently spotted a suspiciously bare patch of land on a Brazilian farm on Google Maps, and they headed out to dig for fossils. This terrifying-looking creature, a dog-sized predator that ruled 260 million years ago, is the awesome result. Discovered in the pampas plains of southern Brazil, this predator has been dubbed Pampaphoneus biccai. 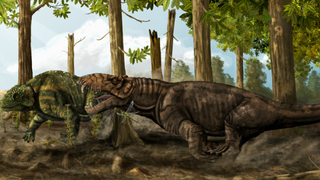 The creature would have been one of the most fearsome predators of the Permian Period, at least 30 million years before the first dinosaurs emerged. Based on its razor-sharp, serrated teeth, the creature was hyper-carnivorous, meaning at least 70% of its food came from meat. Project leader Juan Carlos Cisneros describes it as "a mixture between a tiger and a Komodo dragon", and remarkably it's actually more closely related to the tiger than the Komodo dragon, despite its apparently reptilian features. Though Pampaphoneus biccai wasn't a mammal, it was what's known as a dinocephalian therapsid, who were evolutionary cousins of what eventually became mammals. So, in evolutionary terms, we can consider Pampaphoneus biccai a sort of ancient, murderous, meat-obsessed great-uncle, which is pretty much all I look for in a great-uncle anyway. The specimen is from the Permian period, more than 260 million years ago. The complete skull measures about 13 inches (35 centimeters) in length and was discovered in 2008 during a scientific excavation on a farm in the pampas region of Rio Grande do Sul in southern Brazil...The skull suggests that this South American species was a close relative to similar dinocephalians previously found in Russia and South Africa. That supports the idea that therapsids were able to disperse easily from one part of the Pangaea supercontinent to the other, during an age when most of Earth's modern-day land masses were linked together. Original paper at PNAS. Via Cosmic Log and Discovery News. Artist's conception by Voltaire Neto.